Sandra's soup is amazing! I love jasper in general but your earrings are tempting me to go in to the studio past midnight and dig out my jasper stash! Wow! I can see that you really made an effort to pick out seed beads that reflect the colors of your focal. Nice effect. Tracy you did an outstanding job! I love the simplicity and elegance of your creations! Great job. Wonderful having you as a partner too. I'm going to echo one of the previous commenters, Sandra, in saying that I love how you came up with understated, elegant designs that let the beauty of the beads do the talking. The pearl necklace really caught my eye - the colours are striking and I know how much work silk knotting can be. Fantastic job! I love what you did. I am of the simple is elegant school and I think you showed off those ingredient to perfection. NIce job! Ahhhh! Thanks for letting me know. Had no idea it was on. I really like the dangle bracelet! I love working with those colors. It looks so delicate! A gorgeous bead soup you received! I love everything you made, and I'm jealous of your knotting skills--something I can't seem to do. Of all your beautiful pieces the dangle bracelet is my favorite! How how busy you've been. 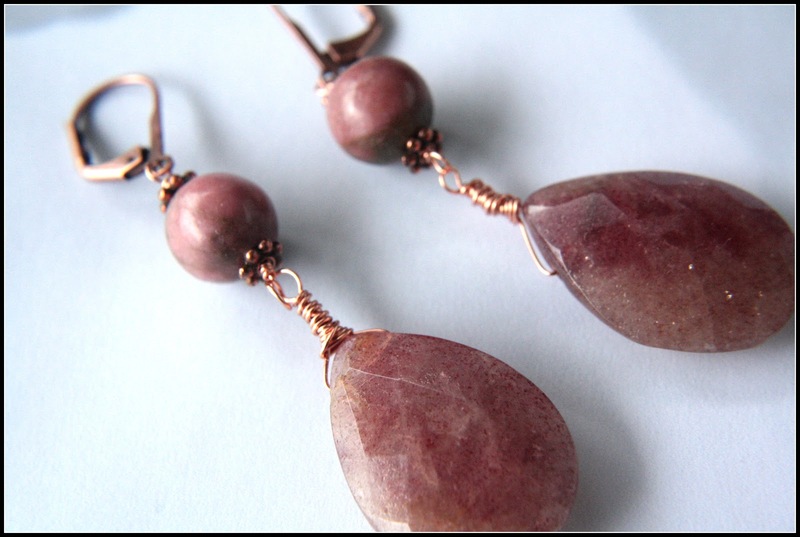 I love those muscovite earrings. You have definitely given me ideas. I'm so glad I got to start the hop with your reveal. I love the simple ease of your pieces. You showed that it doesn't have to be complicated to be beautiful. Every one of your pieces is so very wearable. I'm with you, that second pair of earrings is awesome! Great job! I'm a purple person, and love your soup. 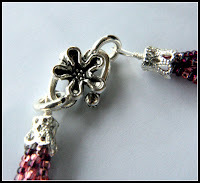 With your pendant, definitely simple is better, and great job with the seed bead color to match. A great job! The colors in that jasper are stunning and you showcased them beautifully! I bet those earrings will be getting lots of attention when you wear them! Beautiful! Simple, elegant, romantic - I sey 'Yes' to that. Stunning jewellery. Well done. I really love that last bracelet piece! Lovely! Sometimes simple is just perfect. that's what you have here. Lovely! Lovely. I think I like the pearls best, but your second earrings are soooo something that I would wear. Hard to choose. Good work. Like the copper with the purple and pink. I totally agree, when beads are particularly patterned or colorful or special, why mess with that? 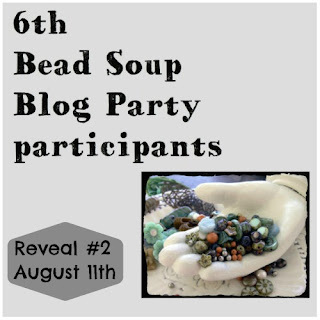 That's why I redid my bead soup two soups ago -- I messed with it too much and redid it to a three strand simple and now I wear it all the time! Thank you so much for participating, and I hope to see you again in Jan/Feb! I would wear that jasper pendant necklace constantly, I love what you designed! oh my goodness what absolutely gorgeous color scheme! I love the creations that you designed with your soup. I love all your pieces they are all beautiful. My favorite piece is the first necklace. I love the simplicity of the design it is gorgeous. 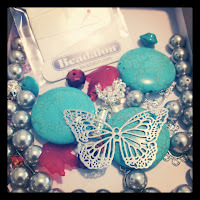 Love those beady goodness you received! The designs are simple and elegant and look like so much fun to wear! Stunning work! Such rich colors, love what you have done with the rectangle focal, your color mix of beads is perfect... simple is superb. The dangle bracelet is very lovely too! Beautiful pieces. I think the first necklace is my favorite. I think your design choice was spot on for this pendant. Simply perfect. Your designs came out magnificent! 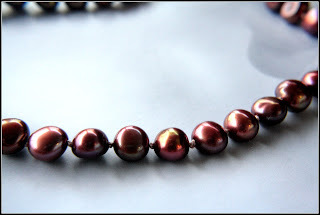 I love the simplicity of the knotted pearls. Very timeless and elegant. Great work! I love how you went simple with the first necklace and it turned out fabulous! 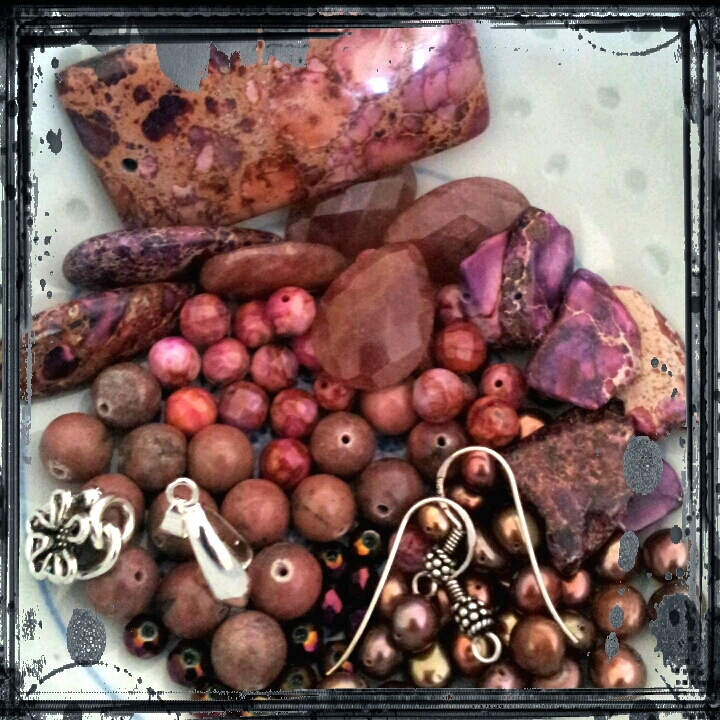 Yum, jasper and agate, what a wonderful bead soup! Love everything! You were right, the pendant speaks for itself, pairing it with the seed beads was perfect. What a great soup! You made great pieces. Simple and stylish. The colors are beautifully displayed. YOur pieces are lovely.You managed to get the best from the colours without overwhelming them and so many beautiful pieces. WOW, you made some amazing creations!! I just love how you matched up the beadwoven strap with that focal, perfect fit!! Very pretty! Love the necklace with the jasper focal! Gorgeous necklace and all the pieces are beautiful. Love the clean lines of all of your pieces. The match of seed beads with the focal is perfect! beautiful soup and your pieces are just lovely, loved them al! 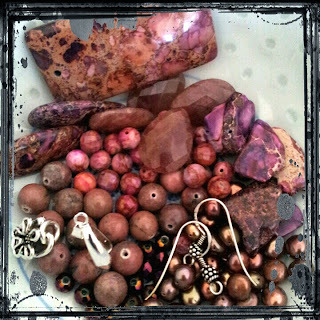 Your bead soup is yummy...that Jasper focal bead is even yummier! Great job...such beautiful creations! Great Job!!! Luv all ur designs! You totally rock'd it grrl!! All beautiful and elegant pieces!!! Great work!! 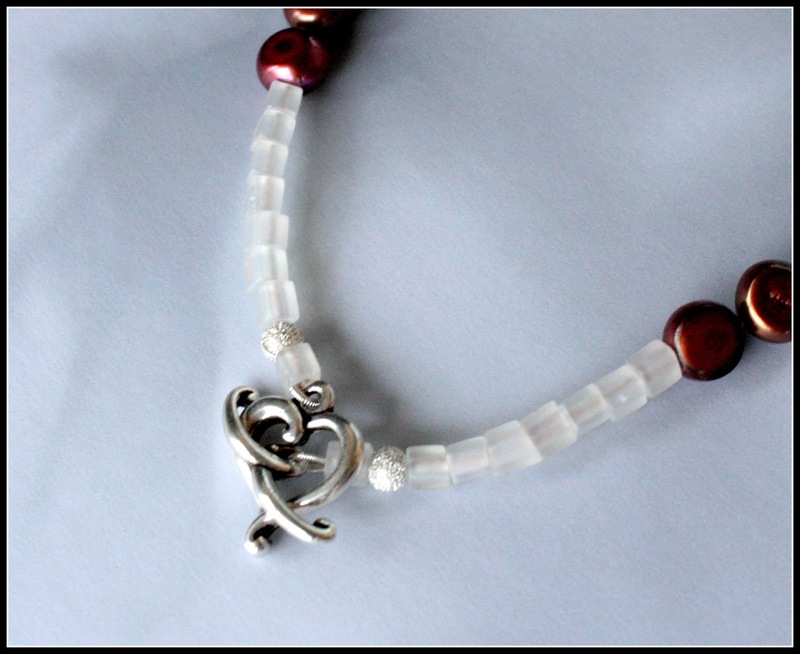 Great choice to use the coordinating seed beads to highlight the pendant and your bracelet is too cute! Your work exudes beauty in simplicity! Lovely! Just beautiful! You are so right about that first necklace. The seed bead strands are perfect for that pendant. I call that color purplink! Great job. Wonderful job, I love your creations - they are all beautiful. I like your designs. Very creative. Lovely designs I especially like the first necklace its very elegant. Lovely soup. I agree the simplicity of the first necklace really lets the focal shine. I like how the strands are made from different colours of beads which all match the focal. 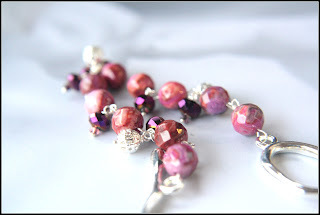 My other favourite is the 2nd pair of earrings - especially the purple dangles. A very pretty set of creations, love them all! Love all your pieces! Very classic. I love the colors in your soup. Great job! I love the colors you picked to go with the focal...beautiful!